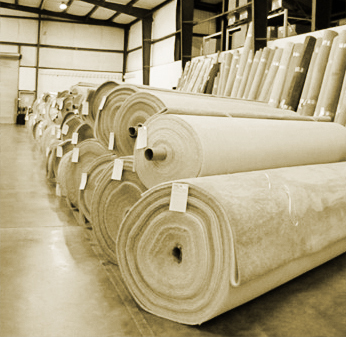 Carpet/Pad is inventoried and stored in our Georgia warehouse. Carpet / Pad is measured and inspected. Client is provided with a manifest of the carpet /pad received and condition of materials. Clients are given the option of having EC&F refurbish their carpet. This includes repairing of all cuts and holes. Carpet can also be seamed to any size to meet client’s needs for future use. Client have the option of having their carpet cleaned with our in-house state of the art cleaning equipment. Client is notified of the condition of carpet after cleaning has been completed. Carpet is inventoried and stored in carpet racks until client needs carpet shipped. Carpet can be cut to any size, wrapped and shipped to any location. If at any time the client decides the carpet is of no use, EC&F can recycle carpet. This is an effective way to cut costs and have the assurance that your carpet will be in the hands of professionals that specialize in carpet for the industry.